Twenty new Ford Fusions, equipped with more self-driving technology than its predecessors, are joining the automaker's test fleet. 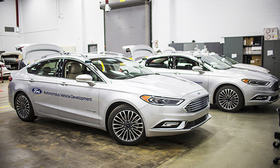 DETROIT -- Ford Motor Co. has added 20 vehicles to its existing fleet of 10 autonomous Fusion Hybrids, retrofitted with more advanced driverless technology and reduced hardware. In a blog post published Wednesday, the automaker said it had expanded its pool of self-driving test vehicles that is being used for the development of an autonomous ride-hailing fleet, expected to be introduced in 2021. The additional vehicles are Fusion Hybrid sedans outfitted with two lidar sensors with 183 metres (600 feet) of range, three camera sensors and short- and long-range radar sensors capable of functioning in inclement weather. The original test vehicles required four lidar sensors with a range of 61 metres (200 feet). The new test vehicles include an additional power generator to support the autonomous software’s computing functions. “A standard gas-powered car doesn’t have enough electrical power for an autonomous vehicle, so we’ve had to tap into Fusion Hybrid’s high-voltage battery pack, and even that isn’t enough,” Chris Brewer, chief program engineer for Ford’s autonomous vehicle development division, wrote in the blog post. Ford expects to operate Level 4 autonomous vehicles -- which require no human intervention -- without a steering wheel or brake pedal for its 2021 fleet; however, the new additions to its test fleet still contain those controls. The automaker is testing the vehicles in Michigan, California and Arizona and said it will triple the number of driverless prototypes to 90 in 2017. Though Ford has been making progress in autonomous vehicle development compared with other traditional automakers, it is also competing with aggressive new entrants to the industry. Waymo, formerly known as Google’s self-driving car project, said earlier this month that it is testing 100 driverless Chrysler Pacifica minivans and 30 of its own “Koala” cars on public roads. Tesla Motors Inc. is exposing its autonomous software to millions of miles of real-world experience by operating in “shadow mode” in all Tesla vehicles equipped with its self-driving hardware. While in shadow mode the car isn’t taking any autonomous action, but it continues to register the moments when it would have taken action.